Each week you’ll see Liz Cantor and Sammie O’Brien reading the lotto numbers from the Channel Seven Mt Coot-tha studios. 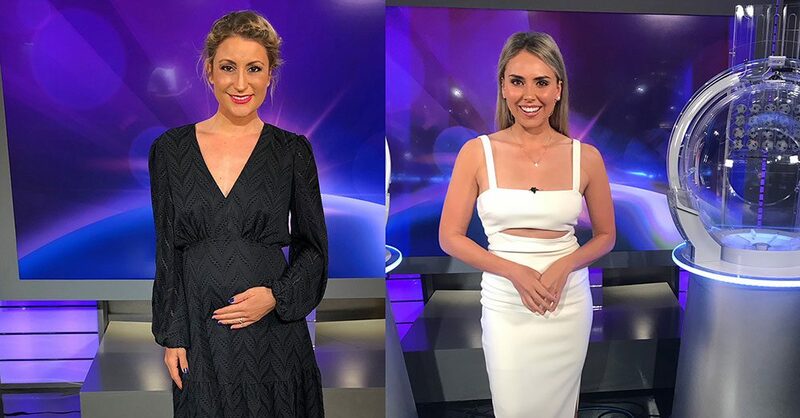 Dressed by Toowong Village each night, Liz and Sammie are great ambassadors for our fashion retailers and never fail to offer inspiration for the best looks of the week. Whether it’s their various presenting roles or busy schedule in general (Liz is a mum of one with another on the way), these girls have high-demand wardrobes. Here, they share a bit more about their personal style. Liz is a presenter for Queensland Weekender, Creek to Coast, the live national Lotto Draws and 7 News Gold Coast Weather. How would you describe your style off-air and how does that compare to your on-air style? When I’m in studio my style is definitely more colourful and glamorous! I find that solid, bold colours work really well on camera. You don’t want anything too busy, or prints that distract from the information you’re there to share. My roles really swing between casual lifestyle …. Creek to Coast, where I’m boating, fishing, surfing and more formal, often evening wear for the Lotto draws. Weather is a mix in-between depending if I’m on set or on location, generally more corporate in direction. In my own time, I’m a jeans and t-shirt kinda girl. I was sponsored by Billabong for surfing all through my teens and up until my early 20’s my wardrobe consisted of that one brand! These days, I like to mix and match but my go to brands are Zimmerman, Rag & Bone and Manning Cartell. You’re due to have your second baby quite soon. How has that changed the way you dress and get ready for work with a changing body and a toddler in tow? What do you love about The Village? It’s a practical, easy to access location. It’s a mall where you won’t get lost and can get in and get what you need, have a bite to eat and get out! Because, hey, time’s precious when you’re living Mum life! Sammie is a presenter on Creek to Coast, Queensland Weekender and the national Lotto draw. My style off-air is very different to what people see on-air! I love nothing more than wearing my exercise gear (cliche I know) but comfort is everything! I’m very casual outside of work, so if I’m not in my active wear, I would generally go for a pair of jeans and a white tee. You travel a lot for work. How do you stay organised? Do you have any great packing tips? Travelling a lot means you don’t really have a choice but to be organised! I think the best thing to pack when travelling is snap lock bags. It sounds weird, but they make it so easy to sort the clean from the dirty and keep everything in their spots! What do you love about The Village?